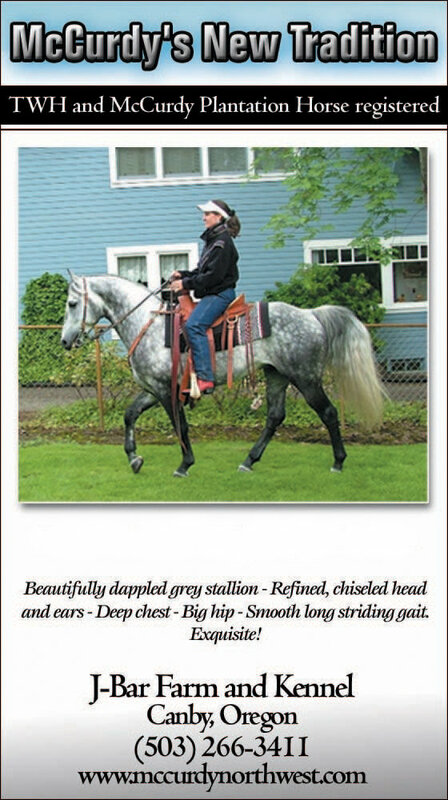 Young "Tradition" was a beautifully dappled gray stallion with a heavy mane and tail. With age, he has become a stunning flea bit gray. He has a refined and chiseled head, BIG kind eyes, big hip and deep chest, short back and great bone. He is exceptionally calm and willing and affectionate. His gait is smooth and deep striding with a slow racking horse canter. He is five-gaited under saddle: flat walk, smooth McCurdy lick, fast gaited walk, trot and canter. This shows his true balance to perform both lateral and diagonal gaits. Tradition's bloodlines go back to "McCurdy's Fox" and "McCurdy's Doctor" as well as "Sun's Delight D" on his dam's side and "Carbon Copy", "Ebony's Masterpiece" and "Triple Threat's Copy" on his sire's side. Intelligence, Smooth Gait, Color, Conformation, Disposition.